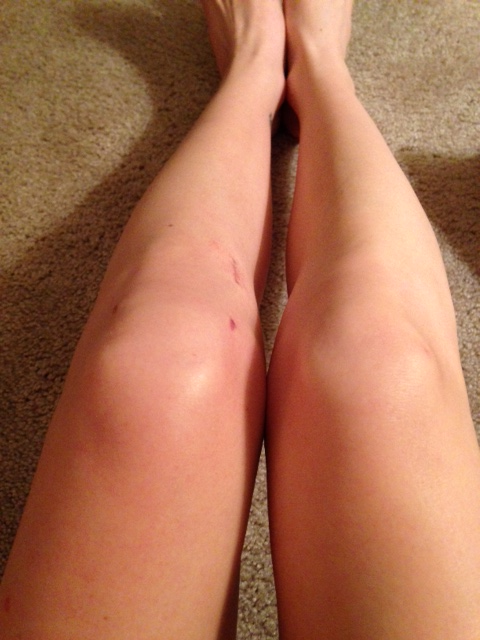 It has been a hectic week, but luckily my knee has been able to keep up! Between relatives being in town, spending time with family, doctor appointments, physical therapy, working late, and starting my spanish classes this week – I haven’t been able to get to bed before midnight this entire week. But I have loved every minute of it! My knee is feeling GREAT – I have almost full ROM, can walk completely without a limp, am working out on the elliptical now and have no issues riding the bike (before my knee cap would pop out). 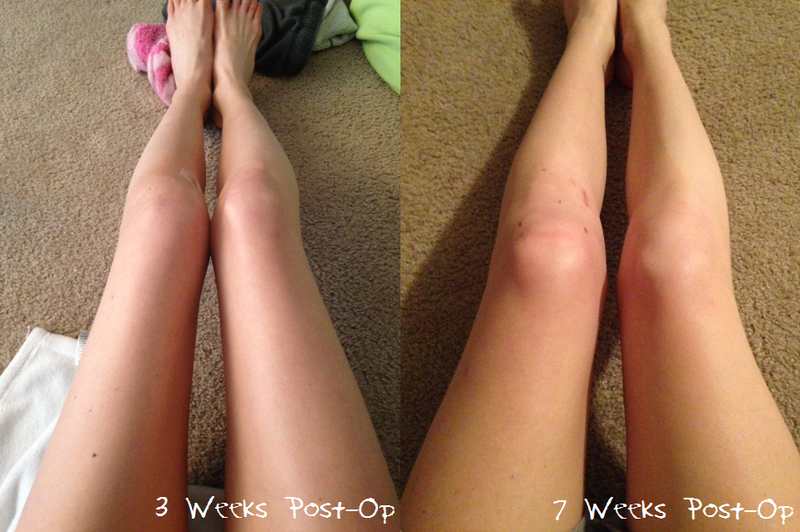 Below is a recap… and a comparison of my legs 3 weeks post op vs 7 weeks post op… my muscles are coming back!!! 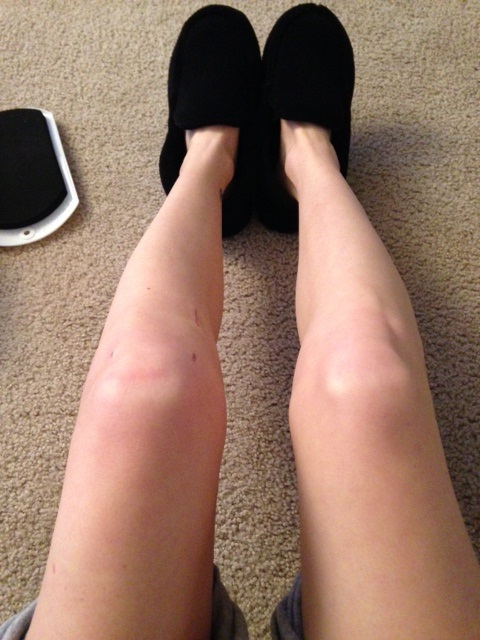 Continuing strength training on my leg – one-legged squats, leg press, lunges, etc. I have no problems going up and down the stairs, my quad is considerably stronger, and I actually feel like I am getting a workout at the gym now! Added my first lateral movement at PT!!! Side-stepping onto a bosu ball, ball side up, then stepping down on the other side. 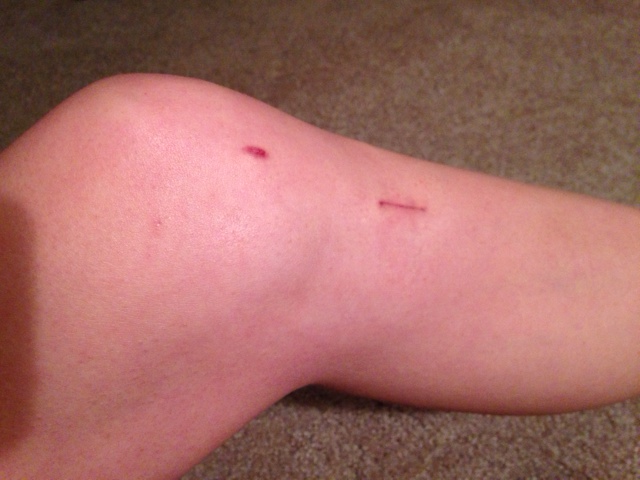 Locking out knee – this is still a little bit of an issue. I can lock out my knee, but doing balancing exercises on it really puts a lot of strain on my knee… Like it feels a little unstable/not strong enough. I have hyper-extension in both knees from years of gymnastics, so I feel like being 100% straight isn’t really 100% – my knee needs to go past 0 degrees. That’s ok – I’ve been doing balancing exercises to help stretch out my knee, which is also helping strengthen those ligaments/muscles around it + the ART therapy is helping a lot. 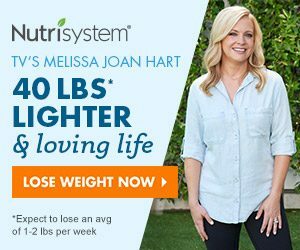 Started taking calcium vitamins – I am working hard to get my bone health back. 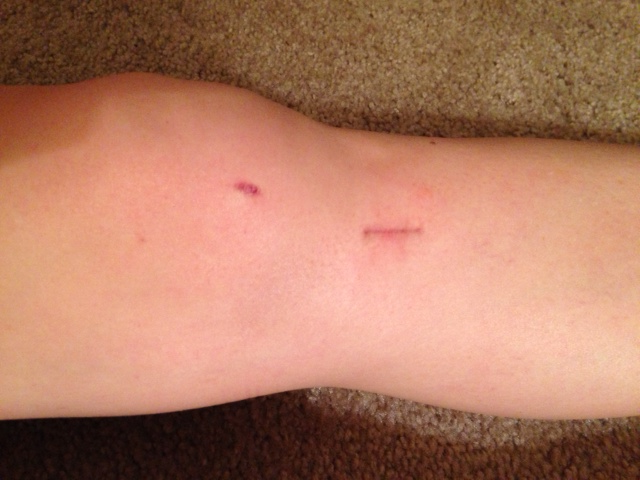 This surgery was a blessing, as I found out that my tibia bone was soft. Taking Solomon’s Seal – I feel like I have lot more energy now. I haven’t noticed much other benefits, but it could take up to a month. I was taking 5-10 drops 2-3 times a day, but it made my heart race and I had trouble falling asleep. So now I am only taking 1-3 drops 1-2 times a day, which seems to be a good start. I will build up to more drops later down the road. My physical therapist told me weeks 6-10 is when most people start to feel “normal” or really great… and its the time where you are at the biggest risk of doing something stupid and wrecking your knee, because your new ACL hasn’t completely stabilized to its full strength. Apparently when the ACL is put in, the muscle fibers are all tangled up and a mess. The more you move your knee and do PT, the fibers begin to straighten out in the direction of the movement of your knee. Pretty cool! I am getting antsy to start moving more, but at the same time, loving every minute of my healing process. Our bodies are so resilient, and it amazes me every day how fast it can heal itself. Regardless of the pain, this surgery has been such a positive experience (what?!). It has taught me so much about my body, slowing down, being more in the present moment, and to appreciate everything that happens in life, good or bad. I know I am helping others going through similar situations, and I love that. The past month and a half has been such a whirlwind, but I would never change one thing about it. 2 more weeks till I am in the clear! 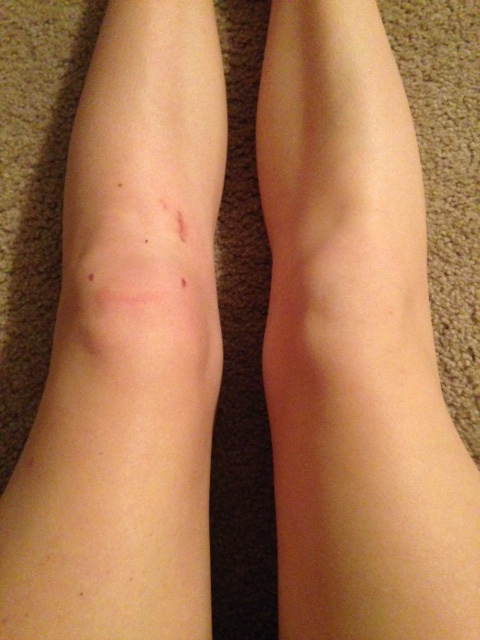 Right about now, my new ACL is beginning to stabilize, and by week 8, I will have the go-ahead to start moving some more. With that being said, I am already doing a lot physical therapy-wise, at least the most I can do. A few days ago I reached 145 degrees flexion!!! 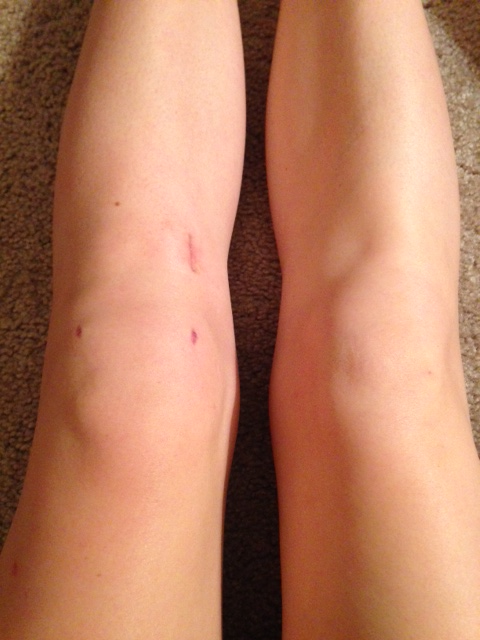 Today I feel like I have pretty much full ROM… I do have to move my knee a few times, but it finally gets there. I am still going to PT 1x a week, which isn’t really challenging or difficult for me. My PT doesn’t know what else to give me to work on! And I am ok with that. 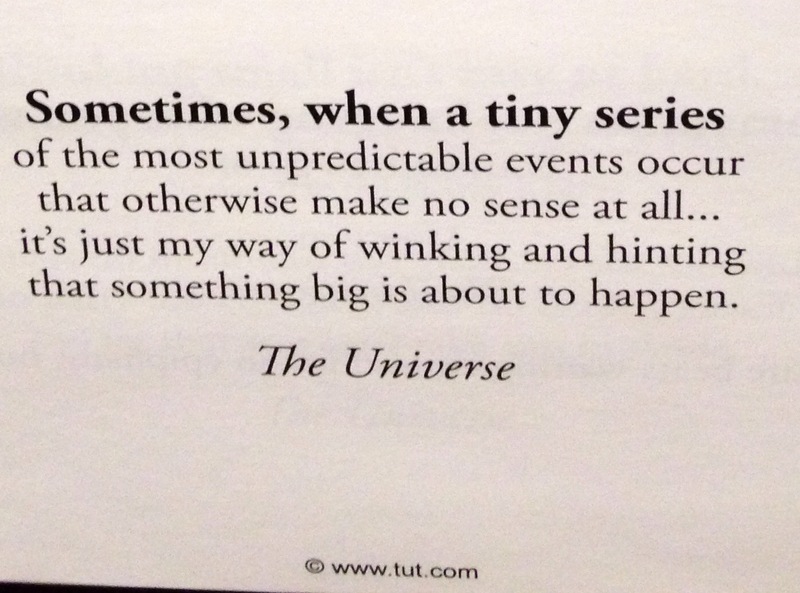 Through out this whole experience, I have learned to be patient. I am learning to listen to my body, and be ok with where I am at. If I take care of my body now, it will be so much stronger down the road. 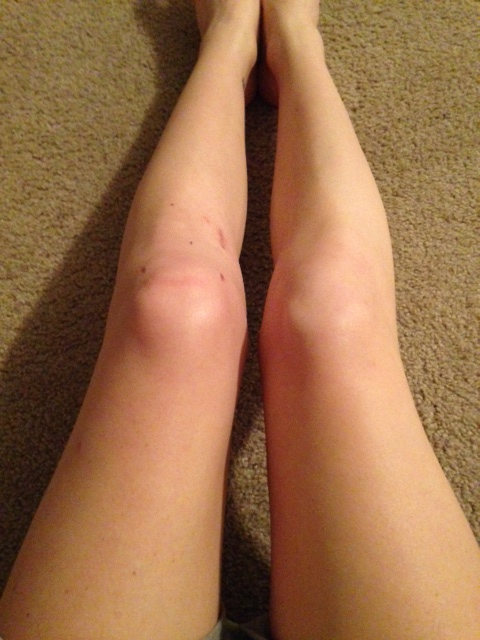 My IT band (where it connects on the side of my knee) has really been causing a lot of pain for me, so bad to the point where it hurts to try and even straighten my leg. It makes my knee feel super stiff, and causes me to have to walk with a little limp since it’s uncomfortable to fully extend my knee when walking. Also, the muscles behind my knee – that connect my hamstring & calf muscles – have been cramping up really badly, especially when I try to work on hamstring strength or even massage the area! Luckily, I found someone locally who practices A.R.T – Active Release Therapy. I scheduled an appointment, and afterwards had no pain. Unfortunately, it takes a few appointments to really work out the problem areas, so the pain was back the next day. I am going again on Sunday, so I will post how well it is working for me in future posts! Fingers crossed! Also – I went to my first yoga class since the night before my surgery… and it was great! I went to Bikram yoga, which is yoga in a heated room (up to 110 degrees) and 26 poses are performed twice in 1.5 hours. 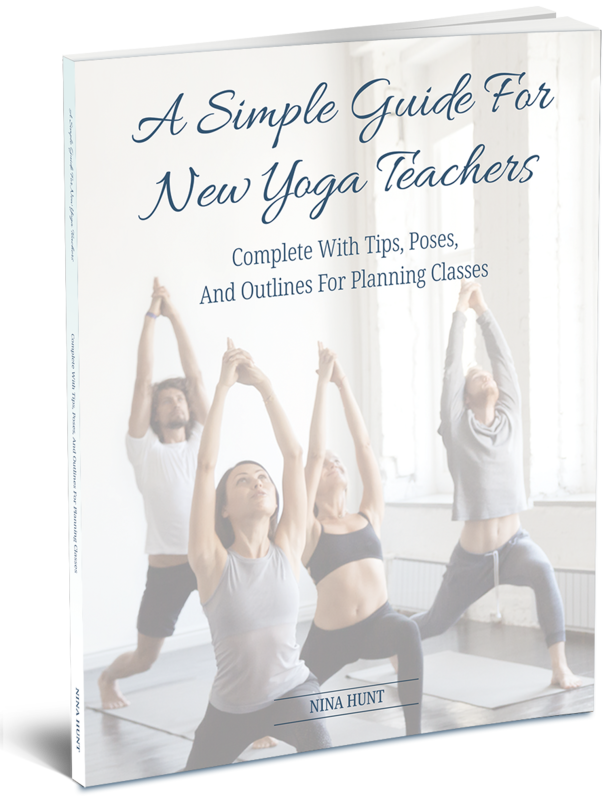 The class is definitely more restrictive than hatha or restorative yoga, but it offers amazing medical healing benefits. I couldn’t do half the poses, and some I could only do on my stable leg. But it is definitely a start! I will continue to do Bikram about once a week, maybe another heated yoga class so I can move a little more freely in different poses. 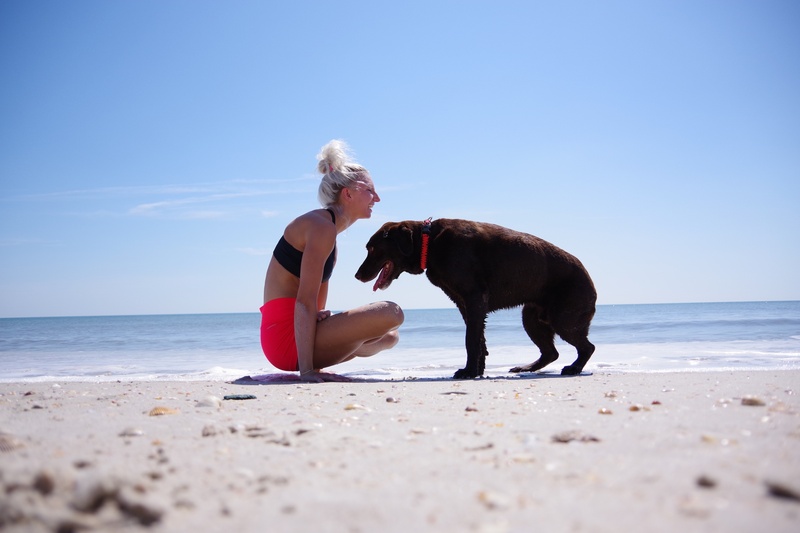 I was worried with all of the sweat I would be slipping, but I was very careful and aware of my body the entire time – I did not ever put myself in a position where I could slip or twist/pivot/sit on my knee. And I had a towel over my yoga mat, so the 5 buckets of sweat dripping off me was absorbed by it 🙂 Some of the poses I would try to go in, thinking I might be able to do it – but would immediately stop. I am so close to being out the red with my knee that I can wait a few more weeks and not do a few yoga poses… I’ve gone this long so far and survived! A few milestones/things I am working on are below! • Bones (stress, strain, fracture), cartilage, arthritis, bursae, synovial membranes, etc. • Gastrointestinal inflammation and injuries, as well as bronchial issues and coughs. • Blood pressure regulation; gentle detoxification of liver, etc. 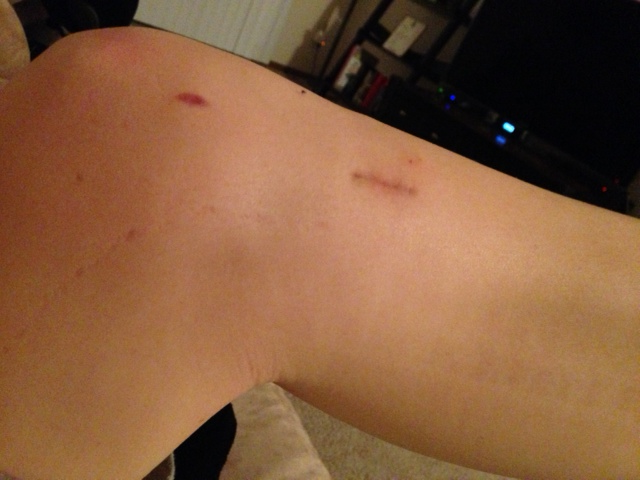 My scars are looking great! 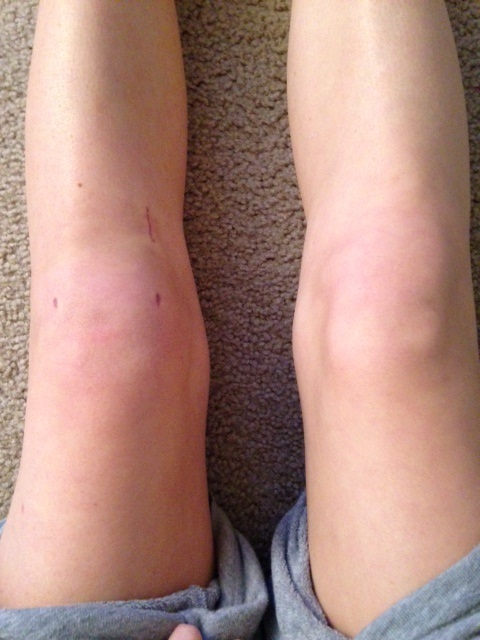 I will do a side-by-side picture of my knee today versus a few weeks ago – the pictures above don’t really do justice as to how far I’ve come! Still applying oils to the scar area – I just ordered some vitamin E and will be using it every day as soon as it comes in! I tried to do a handstand the other day – NOT a good idea… my knee felt really loose and wobbly when I kicked up (I kicked up off my right leg, so my left leg was dangling and it felt loose). I won’t be trying that again for a while, lesson learned! It’s been a very busy past week, and I am EXHAUSTED. Work has been super busy, but I actually love it because I am learning more and taking on more responsibilities. Sometimes I stay up a little bit later at night to fit in meditation/reading on top of it all. I feel it keeps me more grounded and in a better mood when I take time for myself, quiet everything around me and work on growing mentally/spiritually. I am also starting my Spanish classes next week, which will keep me busy! Lots of newness happening in my life, and I love every second of it. 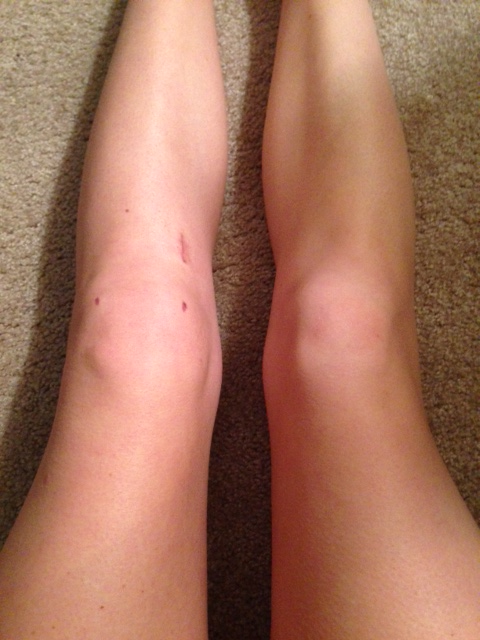 It has been 1 month since my surgery, and I am feeling great! I started working out again (besides physical therapy), doing upper body and abs. I am itching to get back into more intense workouts, but this whole surgery has taught me to slow down. I appreciate my down time, and am learning to listen to my body more. I did ask my PT a few questions, which I will include the answers below. I see my surgeon on Monday and can’t wait to see what he says. Also, I have been progressing so much that my PT only wants to see me once a week now! There are not really any more exercises that the PT can give me + only once a week = easier on my wallet… Sounds good to me! I am also cleared to walk around the house/work without my brace, I just need to wear it if I am walking somewhere my leg might get bumped. Overall, I am feeling really good about my progress; at the same time, I am still being super cautious – I wear my leg brace at night, which is annoying, but I am afraid I might do something in my sleep. I feel like I am mentally and physically exhausted at the end of the day because I am devoting so much of my awareness to my knee, making sure it isn’t twisting, bending too much, etc. After month 2 things will start to get a lot easier (movement wise), although maybe a little more challenging in PT. But that’s ok! 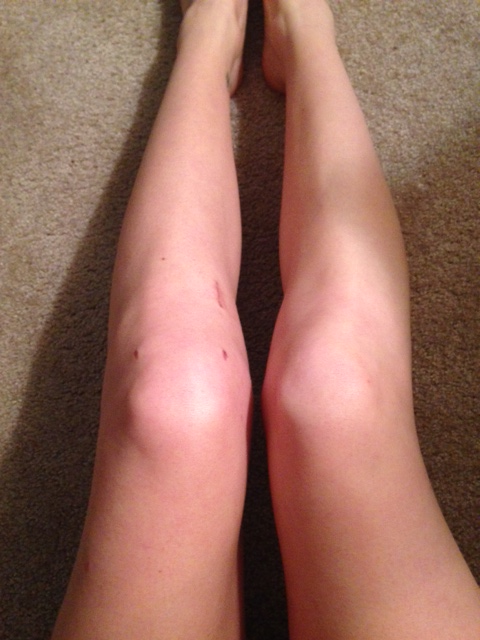 Also – the swelling in my knee has gone down A LOT! 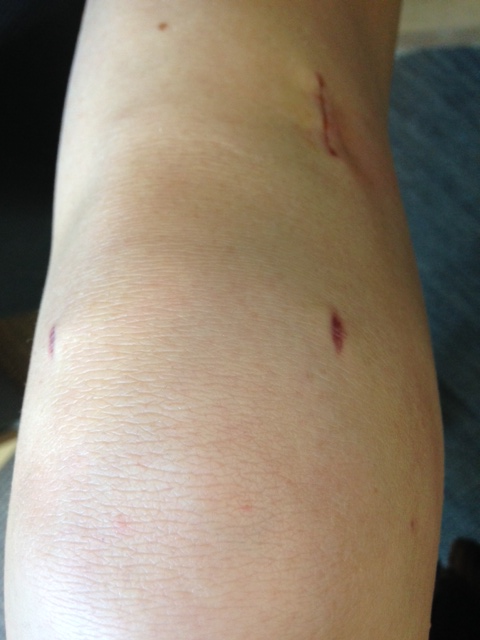 I finally took off my steri-strips on the big scar – it looks impressive! It will eventually fade over time and with the use of Doterra oils, so I am not too worried.